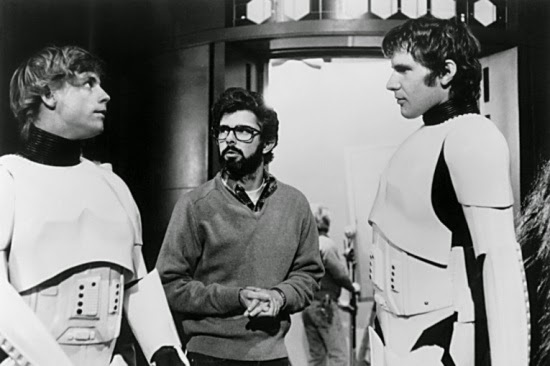 George Lucas' Early Plans For The STAR WARS Saga | Warped Factor - Words in the Key of Geek. In the second of our new weekly Star Wars columns, Nathan Browne takes a look at George Lucas' pre-1980 plans for the expanding saga. In the 1970s George Lucas' plans for what was to become the Star Wars saga were ever evolving, ever changing. The origins lie in a short story he wrote in 1973 entitled "The Journal of the Whills", which followed the training of CJ Thorpe, an apprentice "Jedi-Bendu" space commando, by the legendary Mace Windy. He refined, adapted and expanded the rather complicated story into a new 13 page treatment called "The Star Wars". Further expansion came in 1974 as the first rough screenplay was completed, here Lucas added the Sith, the Death Star and 'Annikin' Starkiller. His next screenplay saw the introduction of the Force, and a shift in protagonists. Annikin was now a wise Jedi Knight, and father to Luke Starkiller, the proposed movie's central character. A further draft saw Annikin replaced completely by a father figure in the form of Obi-Wan Kenobi. "It wasn't long after I began writing Star Wars that I realized the story was more than a single film could hold. As the saga of the Skywalkers and Jedi Knights unfolded, I began to see it as a tale that could take at least nine films to tell—three trilogies—and I realized, in making my way through the back story and after story, that I was really setting out to write the middle story." But in 1976 Lucas was not considering the possibility of sequels as he presented his final full draft. Focusing on a section of story he deemed the strongest and easiest to bring to screen, he wrote what was referred to as "a simplified self contained movie" entitled "Adventures of Luke Starkiller, as taken from the Journal of the Whills, Saga I: The Star Wars". As production got underway, Lucas changed Luke's name to Skywalker and reduced the title twice. Briefly returning to "The Star Wars", before finally settling on "Star Wars". It seems that it was when he was nearing the actual filming of "Star Wars" when Lucas first felt confident enough to suggest a possible sequel to the movie. He made a minor revision to the approved script mentioning "The Princess of Ondos", which he considered a possible storythread for another Star Wars movie. It wasn't long after this that Lucas managed to re-negotiate his contract to stipulate that if "Star Wars" was a success he would be able to produce two sequels. We all know that it was a huge success, changing science fiction cinema forever, and so Lucas immediately began work on the next movie. By November 1977 he had written a short treatment for "The Empire Strikes Back". In this treatment Darth Vader is not Luke's father, in fact Annikin (double 'n' still) appears to Luke in the form of a Force spirit to offer instruction. Lucas originally hired Leigh Brackett to write the screenplay based on his treatment, and whilst she worked on her draft script, Lucas began noting out a possible backstory to include in a later sequel. He wrote notes about the path Darth Vader took to the dark side, how he killed Luke's father, then fought with Obi-Wan Kenobi on a volcano, and the fall of the Galactic Republic. Brackett presented her screenplay for "The Empire Strikes Back", but Lucas was unhappy with the result and wanted a re-write. Unfortunately Brackett passed away, which left Lucas to pen the rewrite himself. His initial draft included the very first use of the word "Episode" in the title, but at this time he was still referring to "The Empire Strikes Back" as "Episode II". So it would seem that Lucas considered any backstory would likely be included in flashback form only. By the end of April 1978, Lucas had completed three drafts of his new screenplay. He'd added some previously unconsidered scenes for the principle characters which could be picked up in the third movie. These included Han's carbonite imprisoning, and the big twist where Darth Vader claims to be Luke's father. It seems that prior to this draft screenplay Lucas had never once considered the thought of Darth Vader as Luke's father. Happy that he was taking the saga in the direction he wanted, Lucas handed his draft over to Lawrence Kasdan to complete the final screenplay, but not before he had once again revised his backstory to reflect this new revelation. His new take on the backstory would see Anakin Skywalker as Ben Kenobi's student. After fathering a child named Luke, he was swayed to the dark side by Emperor Palpatine (at first referenced to as a politician, but quickly re-titled a Sith). Anakin and Ben's final fight on a volcano would see the student wounded, and resurrected as Darth Vader. Ben then hid Luke on the remote planet of Tatooine, as Vader took his anger out by systematically hunting down and killing all the Jedi. As his backstory took shape and became more rich and vivid, Lucas felt there was too much material for just a flashback, too much even for a single movie, and so he decided that he had the makings of another trilogy. It was late April 1978 when for the very first time "The Empire Strikes Back" became "Episode V", and so it would seem that it was almost a whole year after "Star Wars" was released when Lucas first considered that he was making the middle part of the saga. Quite contradictory to his later comments that he'd planned it almost from the beginning. EPISODE I: Almost disconnected character wise from the later chapters. This film would focus on the origins of the Jedi Knights and how they are initiated and trained, and the 'birth' of the Emperor. EPISODE II: The first appearance of Obi-Wan Kenobi, and his path to becoming a Jedi master. EPISODE III: The first to introduce Anakin Skywalker. This film would show his training as Obi-Wan's student, his path to the dark side and rebirth as Vader. EPISODE IV: As we knew it. EPISODE V: As we knew it. EPISODE VI: "Revenge of the Jedi". In Lucas' description to Kurtz he said that Han would be rescued from carbonite but die in the conflict. Leia would be elected "Queen of her people" leaving her isolated, alone and heartbroken. Luke would confront, and beat Vader, and then leave to be alone to study the Force. Essentially becoming a hermit, almost like Yoda had been. But the most important difference between this planned movie and the one that became "Return of the Jedi" was that Leia was not Luke's sister. EPISODE VII: Kurtz said that Lucas had very few details planned out, but the whole of the third trilogy was to focus solely on Luke and his further mastering of the Force. This movie would include the start of a quest to find his sister. EPISODE VIII: Luke locates his sister (still not Leia), and we the audience are introduced to her for the first time. She has been hidden in another part of the galaxy. Possibly held by a dark force, which would seem likely given the details of the final movie. EPISODE IX: The final chapter in the saga would see the first full appearance of the Emperor, having only been seen communicating with Vader and other Imperial Officers before, as witnessed during Empire. This would be Luke's final battle to restore peace to the Galaxy. His sister may have been at his side, or she may have been in opposition. After "The Empire Strikes Back" was released Kurtz parted company with Lucas over the change in story direction Lucas was taking. He felt that "Return of the Jedi" was becoming too much of a rehash of "Star Wars" and was upset that almost all of the darker themes implemented during Empire were being written out. But the journey from 'Revenge' to 'Return' is one for another day. After 1981 George Lucas would constantly contradict himself in interviews as to how many movies he intended there to be. At one time he claimed the number was as high as 12, yet in an interview with Time Magazine in 1983 he said that the story was complete and there would be no more installments after Jedi. We all know that he was eventually tempted to go back to the Star Wars saga, and unless you've been living under a rock on Tatooine you will know that we are just 8 months away from Episode VII. How that movie plays out remains to be seen, but with many people (myself included) feeling that "The Empire Strikes Back" is the high point in the whole saga, you can't help but wonder what could've been if only Lucas had stuck with these plans. The prequels as we know them are not that drastically different, but what a huge effect it would've had on the upcoming trilogy.